Originally published under the title, "Muslims, Europeans, and Boiled Frogs." 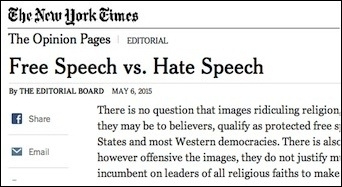 Today's New York Times editorial on the Garland, Texas affair protests a bit too much. Not to quibble, but a cartoon contest in Garland, Texas, like the 2005 Mohammed caricatures in the Danish newspaper Jyllands-Posten and the 2014 Charlie Hebdo depictions, only reached a large Muslim audience because Muslim organizations chose to make an issue of images that appeared in obscure publications with a small circulation. The cartoonists did not cause the anguish of millions of Muslims: Muslim authorities of various sorts elicited the anguish of their constituents by denouncing them. If Muslim leaders had ignored the cartoons, the millions of devout Muslims cited by the New York Times would have gone about their daily lives suffering anguish from another source: the cruel and inevitable encroachment of modernity on traditional life. Islam is fragile, far more fragile than the traditional Catholicism that flourished in Italy, Spain, Ireland and Quebec only two generations ago and now is in shambles. We know this because the number of live births to Muslim women is falling faster than in any documented case in the history of the world. Fertility and faith are inextricably linked; academic literature on the theme is deep and persuasive; I reviewed it in my book How Civilizations Die (and Why Islam is Dying, Too). As Mary Eberstadt argued in her 2013 book How the West Really Lost God (which I reviewed here), sterile societies lose their desire to bring children into the world before they admit that they have lost their faith. Europe had two centuries in which to adapt to the great wave of secularization, and the old adage about how to boil a frog comes to mind: drop a frog into hot water and it will leap out of the pot, but a frog left in cold water that is slowly heated will not notice that it is being boiled. The Europeans suffered the latter fate, although traditional society in some cases raged against its end (for example, in Spain's Civil War). Europe had the advantage of two centuries of wealth creation, an explosion of scientific knowledge, social mobility and modern governance. Modernity crept up on Europeans, but has hit most of the Muslim world with the suddenness of a boiling bath. Islam has the disadvantages of two centuries of economic stagnation, isolation from the scientific revolutions, the prevalence of tribal society and governance that is as cruel as it is corrupt. Modernity crept up on the Europeans, but has hit most of the Muslim world with the suddenness of a boiling bath. That is the source of the anguish of millions of Muslims. Unlike their grandparents, who sent missionaries to the Muslim world to open Western universities that would bring the benefits of Western civilization to Muslims, today's liberals agonize over Muslim anguish. A notable example is President Obama's mother Ann Dunham. And yet for all that poverty [in the Indonesian marketplace], there remained in their lives a discernible order, a tapestry of trading routes and middlemen, bribes to pay and customs to observe, the habits of a generation played out every day beneath the bargaining and the noise and the swirling dust. It was the absence of such coherence that made a place like [the Chicago housing projects] so desperate. Nostalgia for the supposedly halcyon past of traditional society, and fear for the consequences of modernity, led the likes of the New York Times' editors to twist themselves into pretzels when they address such issues. The Times in 1999 endorsed the showing at a public museum in New York of a supposed art work consisting of a crucifix in a vial of urine, arguing, "A museum is obliged to challenge the public as well as to placate it, or else the museum becomes a chamber of attractive ghosts, an institution completely disconnected from art in our time." This blatant contradiction at the Times has become a staple of conservative bloggers. Europe's confrontation with modernity was tragic; Islam's encounter with modernity is more likely to be terminal. In Yiddish, one says: es soll gor nisht helfen (it won't help at all). Europe's confrontation with modernity in the 19th and 20th centuries was tragic; Islam's encounter with modernity, I believe, is more likely to be terminal. Some parts of the Muslim world cannot sustain the transition. A Chinese expert on South Asia told me not long ago, "Pakistan is simple. DO NOT MODERNIZE. Keep them feudal. Just make sure that the army chief of staff is the biggest feudal landlord." That is sad to hear, but the Chinese are connoisseurs of civilization. China is proof that large populations can make the transition to modernity from traditional life. But China was "modern" in a sense from inception: it united countless ethnic and language groups into a culture founded on a common system of characters and a system of governance that at its best was a meritocracy, often destroying unruly barbarians on its borders who failed to assimilate. Most of the Muslim world, by contrast, is tribal. 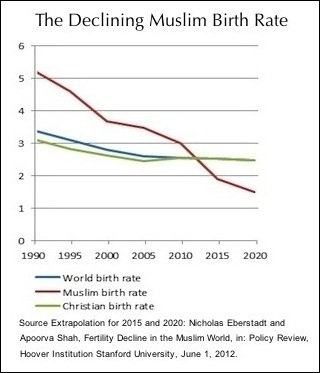 Where Muslim societies try to modernize, they typically proceed from infancy to senescence in a single generation (as in the collapse of Iran's fertility rate from 7 children per female in 1979 to 1.6 children in 2012). Civilizations that become aware that they have past their best-used-by-date typically destroy themselves. That is not inevitable. Some Muslim countries may succeed. Egypt is most likely to, after rejecting a brief experiment in Muslim Brotherhood rule in favor of a true moderate, President al-Sisi. Most, however, will not. Muslim anguish will deepen, whether or not anyone publishes nasty cartoons about Mohammed. There is no greater anguish than knowing that your grandchildren–if any there be–will look with disgust at your photograph, at the quaint costumes of traditional society and antique poses, the relics of a world with which they have nothing in common. To know that the certainties of your daily life will dissolve and disappear, to be replaced by alien nations, is a kind of living death. That is the fate of traditional society everywhere. It was the fate of many of the Europeans a generation or two ago and it is the fate of the Muslims today. The survivors–if any there be– will be countries whose culture was modern from the outset–the United States of America in one way, China in another, and in yet another way Israel. Muslim anguish will deepen, whether or not anyone publishes nasty cartoons about Mohammed (which I do not do, because I do not like vulgar insults against anyone's religion–although I will defend to the death the right to do so). Liberals will agonize along with them. The millions of devout Muslims mentioned by the Times deserve a modicum of sympathy, for life has dealt them a losing hand. The liberals, on the other hand, provide a fine opportunity for Schadenfreude. David P. Goldman is a Senior Fellow at the London Center for Policy Research and the Wax Family Fellow at the Middle East Forum. His book How Civilizations Die (and why Islam is Dying, Too) was published in September 2011. A volume of his essays on culture, religion and economics, It's Not the End of the World - It's Just the End of You, also appeared that fall.